Share your favourite recipe. Talk about the best cocktail you've ever tasted. Or maybe share you fave restaurant experience. Lets talking about food! So experiences or something, huh? Well, as the picture above shows, I love sushi. I'm a lazy cook, so especially around payday I like to go to my favorite sushibar to grab some take out sushi to take with me to work. It's expensive, I have to work a few hours to get even, but it's so worth it! 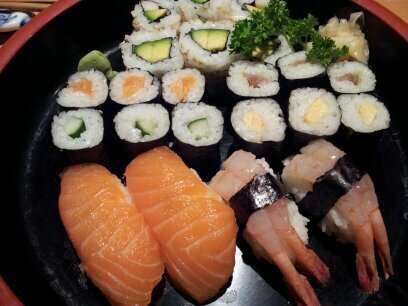 Currently, if I was asked to choose one kind of food for the rest of my life, the answer would be sushi!